It has taken me years but I have finally gotten my 1st tattoo. This may not seem like a major accomplishment, but for years I had resigned myself to never having one. 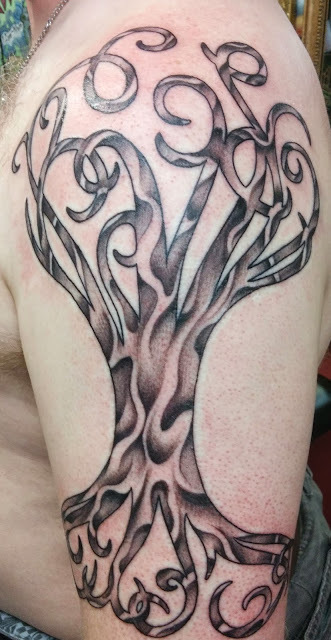 Over the years I have attempted other tattoos, but major issues kept coming up. My 1st attempt happened when I was in the Service, and a friend and I were going to drive to Pittsburgh, to a famous artist to be tattooed,(I don’t remember what I was planning.) When we pulled out of his driveway he rear ended another car, and though we were not going fast, the accident sheared off him engine mounts and pretty much totaled his car. The second tattoo, I had another appointment, I had chosen the tattoo, and all was set, and then my marriage fell apart. My ex-wife and I had made our appointments the same day, and though she was able to make it to her appointment, I was reeling from the divorce and did not make it. The Third attempt was also thwarted by a car accident, I had found a place here in Lansing, and the day of my appointment my mother was in a car accident and totaled my parent’s car, and broke her arm. Needless to say I was at the hospital instead of getting tattooed that night. I took this as a sign that I was not to get tattoos. That feeling lasted until a few years ago. When I felt pilled to get a tattoo, I began looking and for a while I thought I wanted a greenman tattoo, but that did not feel right. As time went on I was leaning more and more towards a tree, the tree. I wanted the worldtree represented and I started looking at various images. It was not until I was in a tattoo studio looking around on the internet while my friend was tattooed that I found something close. I showed the photo to the tattoo artist, said I want something like this, with x changes, and in grey-scale, and he said sure. The tattoo was actually just drawn on in red sharpie, then free hand tattooed, and he could not have done a better job. That is totallly awesome Roy! I started later in life myself on the tattoos!